Chiang Mai is a beautiful, modern yet authentic bohemian city in the northern part of Thailand, which is the country’s second most-visited city. If you do a quick internet research, you will find and read countless blogs and articles from fellow travel bloggers around the world stating how they escaped their 9 to 5 jobs to live a life of freedom, have achieved location independence and are happier than they have ever been. And they will most probably talk about Chiang Mai. What I found out is it’s easy to live in Chiang Mai on budget. If you have some savings, or you can manage to do a remote/ online job, or have some sort of rental income coming from your home, you can afford to pay a $150/month rent and join the expat community here in Chiang Mai! There are excellent shared work spaces, cafes with fast wifi connection and lots of Airbnb type monthly accommodation options for apartments that come with everything you’d need (even with a swimming pool!). There are several options from 6 month tourist visa to education, to volunteer to retirement visa, which also make living in Thailand easier than most of other countries. However, you need to do everything according to the book since otherwise you may pay a penalty for overstaying or even end up in jail. 1. 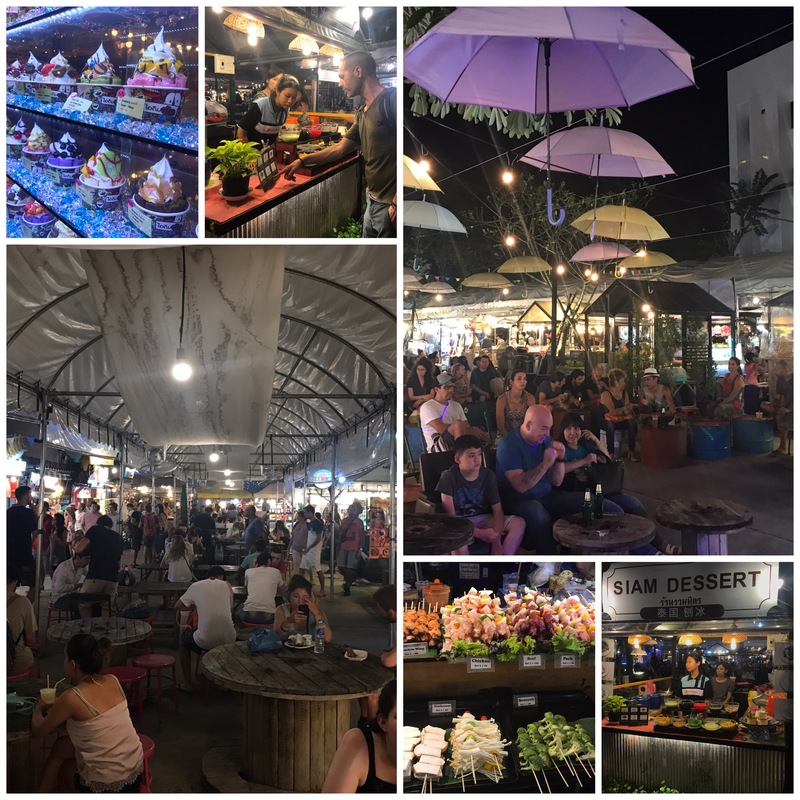 Shopping: A shopping heaven with its Night Bazaar, Saturday and Sunday Walking Streets + outdoor markets that seem to be open as long as there’s life in the streets. They sell northern handicrafts, clothing, fisherman pants, frogs, electronics and all kinds of souvenirs you can imagine. 2. Eating: There are so many healthy, vegetarian and vegan restaurants in CM. Here is the list of the ones I had a chance to try thanks to Happy Cow. Vegan Heaven – same owner with Taste from Heaven and serves mock meat. I reeeeally enjoyed the vegan chicken wrap! Reform Cafe located in Green Tiger guesthouse with a pool. It has a nice atmosphere, good Thai food selection and different types of kombucha options. May Kaidee A local Thai eatery with vegan food. Go early (before 6pm) to choose from the buffet style food for 30-40 thb. You can also visit this page with essential Thai food vocabulary and here for a thorough list of CM vegan/vegetarian food scene. Pluen Ruedee food market is a fun place for eating good food from various food stalls (street truck style) selling yummy international options and mini bars plus its lively atmosphere with live music. It is located along the Changklan night market that’s happening weeklong. Life starts around 6:30 in the market. 3. Wats (Temples): If Thai temples are your thing, then you will love Chiang Mai! The hill-top Wat Doi Suthep is the crown jewels, but the old city is packed with a collection of traditional Thai temples.I spent a day wandering around and visiting some of the gorgeous temples all around town. To be more specific, I rented a bicycle for 24 hours hence could quickly travel between Wat Chedi Luang, Wat Phra Singh (home to a magnificent Buddha statue), Wat Mahawan and some others that I couldn’t get the name of. I have always been fascinated by the intricate detail and effort that went into the construction of these temples. 4. Massage: It’s a massage mecca with services at various rates but my favorite is Chiang Mai Women’s Correctional Institution: stop by for a coffee and get a massage from female inmates! 5. Monk chats: There is a great program that allows english speakers to chat with monks so they can improve their english skills and we can ask our questions! You can find more info here. 6. Hill tribes: Most of these tribes are the immigrants from Burma. They don’t have the necessary paperwork to work in Thailand but the government gave them some place where they could sell souvenirs and present their traditional way of living to the outside world. I thought I could at least support them by buying handicrafts from them but unfortunately seeing their sad faces in a fake environment didn’t give me the feeling of supporting them. 7. Wash and feed elephants: There are many places in Chiang Mai where you can spend time with elephants. I strongly oppose to riding the elephants since they are put through hard work to service the never ending tourist groups. Instead you can find an ELEPHANT SANCTUARY, which are organizations that rescue abused or over-worked elephants and rehabilitate them. I took a tour with TUM TRAVEL which was run by a guy who previously worked at a sanctuary for 11 years. He was very knowledgeable about elephants and genuinely loved them. I definitely recommend him and you can find his info here. Elephant Jungle Sanctuary or Elephant Nature Park are others where you can also volunteer at but they were much pricier than Tum. 8. Thai Cooking Classes – My hostel arranged an organic thai cooking class with Da who picked me up from the hostel, took us to the farmers market to buy the fresh ingredients that would soon go in the curries, rice, soups and salads! He was sweet and opened his own house to us. The mini lesson about herbs in his mini organic garden was fun! You can reach him with the info on his website here. If you don’t know how to ride a scooter, alternatively you can rent a bicycle (available everywhere) and cruise in the small streets of Old City, stop for a coffee in one of the many cool coffeeshops around, and if you don’t drink coffee, make sure to try the Thai bubble tea! 10. Shopping Malls: If you have plenty of time and are bored of hanging out in the touristic old city, the shopping malls located not too far from the old town might be your thing to do to feed your shopping monster. After staying on an island for 5 months, we had to restock a few things before moving on to our other destinations in Asia. You can get a red Taxi/Songtaew to Central Festival Mall, Maya Mall or Central Plaza Airport Mall, all of which have a wide selection of stores like H&M, Uniqlo, etc and movie theatres (4D screen at Central Festival!). Wild Rose yoga – It offers ashtanga/vinyasa flow classes and workshops. I did a few amazing Level 3 type flow classes and learned some new challenging poses. Sometimes two teachers help with your alignment, which I found very nice. Yoga tree – Offers a lot of different classes per day. Good for beginners. Mahasiddha Yoga / Tantra Yoga Thailand The most esoteric based of the schools (tantra yoga). Offers also workshops and retreats. The list compiled with the help of Yep-yoga.com/ChiangMai. Please visit this beautiful yoga and vegetarianism focused blog for more details. Cool season – November to February: It is holiday time, from November through February so it’s the high season for both Chiang Mai and Pai. The cool season features cloudless azure skies and comfortable temperatures. Daytime highs average 25°C (77°F). Mornings and evenings average a refreshing 15°C (59°F). Be sure to bring a jacket and scarf. Hot season – March to June: The average daytime temperature during the hot season is 40°C (104°F). Nights average 25°C (77°F). ALso the fruits season. Especially abundance of mangos, lychees, and mangosteen! Green season – July to October: all three times I was in Chiang Mai was during this season and the weather was humid yet pleasant. The daytime average temperatures of 30°C (86°F) and some rain. Precipitation can range from a heavy downpour of 1-2 hours to a light drizzle all day. Be sure to bring a raincoat. If you are coming from abroad, Chiang Mai has an international airport but most of the flights would probably be directed from Bangkok, which is a 70 minute flight (around $30-50), or 11 hrs by bus or 12 hrs by overnight train. The airport is conveniently located around 10 minutes drive from the city centre and a taxi to Old City cost us 150 thb. If you are coming from the islands in the south like we did, our tickets cost us each $50 from Surat Thani. I prefer Skyscanner.com to compare prices for all domestic and international flights and do all my bookings. It’s been working great so far. Attention: Avoid going to Chiang Mai from February until April as there is a lot of smog because waste is burnt. There are many guesthouses and hotels for every budget inside and around Old City. You can check them out at booking.com or hotels.com. In our last visit, we stayed at a luxury condo (with a swimming pool and gym) through Airbnb and it cost us $15/night. If you are staying more than 2 nights, I’d highly recommend you to check out Airbnb to find an awesome place with a kitchen to live in the comfort of a home. Thailand has been so amazing to me and I ended up staying happily over 8 months. Please check out my related Thailand articles here. Thanks for reading! If you have any comments or questions, feel free to contact me or leave a comment below. Next Post Thailand, my second home!